That usually a modifier to Hold’em. The idea is they chase but then catch at a rate that causes one’s blood pressure to peak. In Mediterranean types, it leads to broken keyboards and flying mice making cracks in the wallboard. Seeing that I’m partial to MS Keyboards and Logitech track balls, it wouldn’t be cost effective to join them. Waffles reported a truly tasteless bit of chatting on his part. It was tasteless even for him. His next post recognizes the flaw. He isn’t stupid…just angry. Anger has to be channeled or you make the news channel. We see the anger tilt all the time. If fact, Waffles preferred aggression get a bit of +EV from evoking it in others. Somehow when he does it, it resembles greater skill and deserves a chortle in the day’s blog. 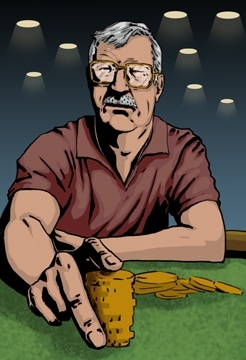 The ongoing argument in the poker world is all about luck versus skill. People quote endless data and those smarter or with better memory evoke higher math and splatter charts. Fairness never enters rational discussion. It stays in the realm of conspiracy theorists that are well represented in blog and forum. Poker was not designed to be fair. It was designed to be unfair. If they could swing it the early players made it unfair to the point of illegality. We express amazement when that reappears online. Calling for fairness is a true DUH! Moment. What do we talk about endlessly? Fish. Donks. What do the pundits use to admonish us? “Don’t tap the glass.” and “Don’t educate the idiots.” The idea is to pray upon the weak. No wonder a nanny government seeks to eliminate it. Another thing we seldom talk about is the rake. 99% of us play at levels where the rake is going to beat all but the luckiest. Yes! Luck! Oh, you can throw in some skill but at the low to mid levels that most of us play, luck becomes a major component. While we are erudite and discuss it all as “variance”, the deck/rake is stack in only one direction – the house. We all know who are pretty consistent in the win column. I don’t really put myself there for a variety of reasons. One who I wouldn’t want to face on a regular basis is B.W.O.P. She’s capable and given a reasonable run of cards will compete. Yet her latest post is really about why most of us play. It is to have fun. That isn’t something most of us will confess to. We probably should. There are more things that distract us from the real goal. Waffles complaints revolve around SnG play. Lot of fun at times. It was a steady feature in the lobby I’d open. But, unlike ring. It denies table selection. Tournament in general has that feature. Not having such selection is -EV. Yet, it is fun and we set that knowledge aside and end up with some sessions like Waffle’s description and rant bring about. Most of the time we don’t know why we are playing or we set a lesser objective ahead of our true goals. That mistaken goal supersedes. That’s as silly as the game gets. Okay — I plead guilty to playing to have fun. It is nice to win money, but when the fun stops, I stop. I guess that is what makes me a true recreational player.